Just about everybody in the video production world either has a SmallHD external monitor, or wants to get one. The SmallHD 501 is as ubiquitous on today's camera rigs as the Rode VideoMic Pro has been to DSLRs. When the 702 Bright came out, it opened a whole new window to using external monitors out in the bright daylight, without hoods, without loupes. Just a super thin, super bright monitor. It was perfect as a director’s/producer’s monitor, or as a camera-mounted monitor on bigger rigs. But 7 inches is a little too much monitor for small cameras. 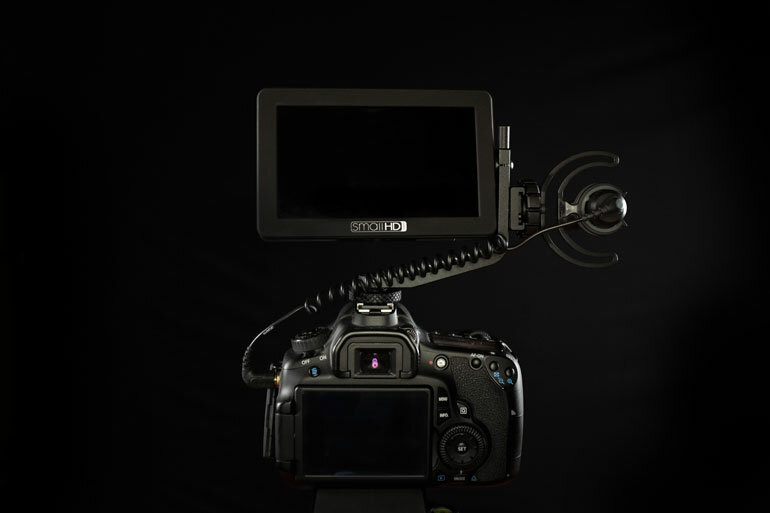 So naturally, fans of 5-inch monitors have been eagerly anticipating the next iteration of the world’s most popular on-camera external monitor, the SmallHD 501 and 502. And SmallHD certainly delivered, right in time for NAB. The ﻿503﻿ Ultrabright. An unheard of 2200 nits of pure, sun-defeating glory. But it’s $2499. Plus battery ﻿plates. As much as we covet the SmallHD 503, it’s a lot of money for videographers like us who want a compact external monitor for field use, but don’t really need one. The professional tools, durability, and power connections of the 503 Ultrabright are really great, but really we just want a simple 5-inch monitor that is daylight viewable, to make outdoor shooting a little easier. Oh well, maybe next year. 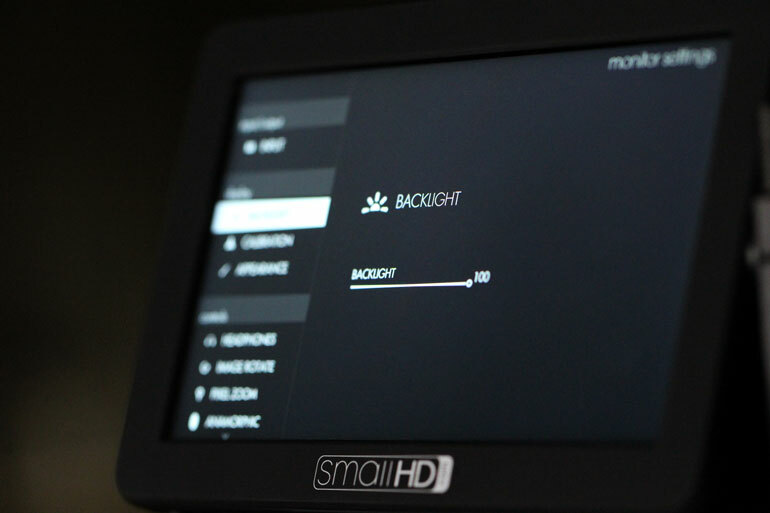 And then, on the second day of NAB, SmallHD announced the FOCUS. Once in a great while, we get precisely what we wish for. 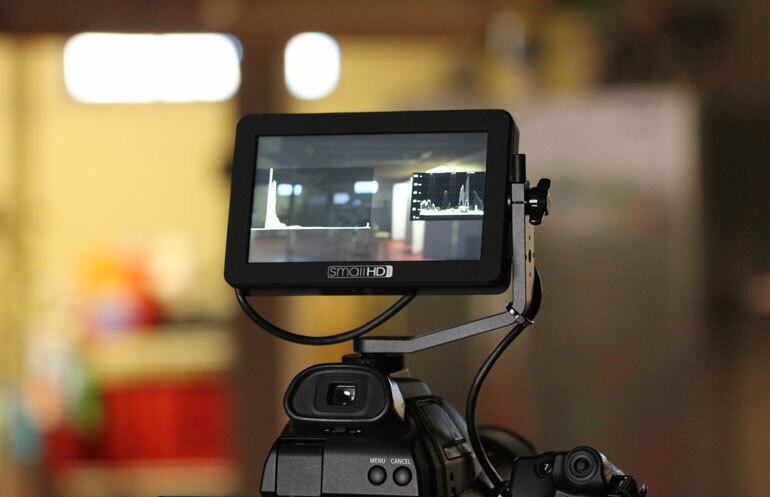 TL;DR: The SmallHD FOCUS is the 5-inch external monitor that many videographers have longed for, and more. At $499, it’s a no brainer. This will be the #1 gear purchase of 2017, 2018, and probably for some time after. It’s a 5-inch monitor, daylight viewable with 800 nits of brightness, powered by one Sony L-series battery tray in the back, connected via HDMI, and is touch screen to make the whole physical design as simple as possible. 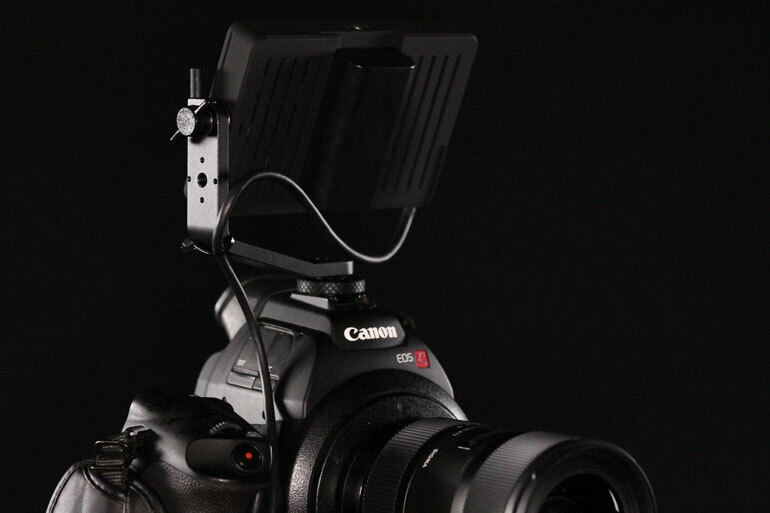 And also it comes with a tiltable mounting arm that attaches to the top of your camera, which also has an included cold shoe mount for mics or other accessories. And it also has the ability to provide auxiliary power to your DSLR or mirrorless camera, which means your long-lasting Sony battery can now replace your tiny camera battery. And it also has all the software features that’s included in the higher end SmallHD monitors, including exposure assist tools, audio monitoring, LUT support, and so on. So, you get a lightweight, SmallHD 5-inch monitor that’s brighter than any other 5-inch external monitor out there (except the 503 of course), plus all those other features, for $500? Say what? After the FOCUS was announced, we ran to the SmallHD booth at NAB and begged for a demo unit to test and review. And thank their North Carolinan hearts, they obliged. So here we are, about a week later, having spent time using it on various cameras. Marketing hype aside, how good is the SmallHD Focus in practice? What’s the catch? Please note: this is a preproduction model of the SmallHD FOCUS, so little features are still being fine tuned, such as the software and included accessories. At 800 nits, the FOCUS is about 2-3 times the brightness of most 5-inch external displays currently on the market. At NAB, SmallHD opted to house their booth outdoors this year, specifically so attendees could play with their monitors outside in the super bright, Las Vegas sunshine. 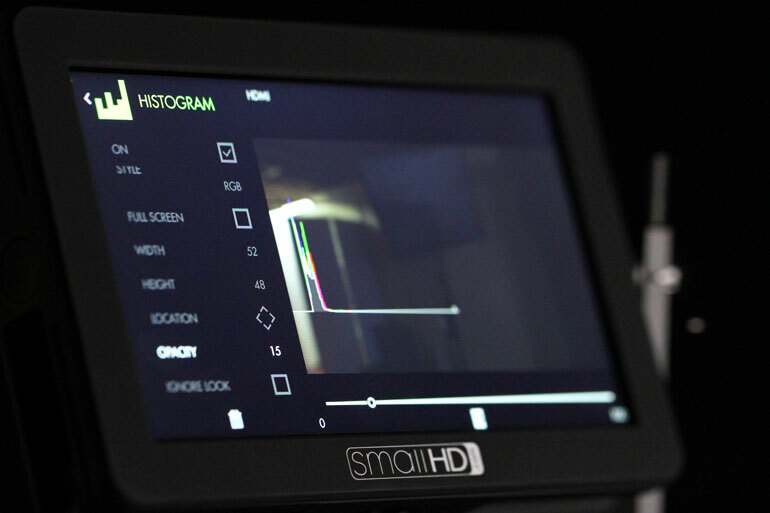 It was a smart move for SmallHD. Back at home, we used the FOCUS on 100% brightness under normal sunlight and cloudy conditions, and we were thoroughly impressed. It’s not as bright as the 503 of course, but it’s good enough. And it’s an upgrade to most cameras’ built-in LCD displays. 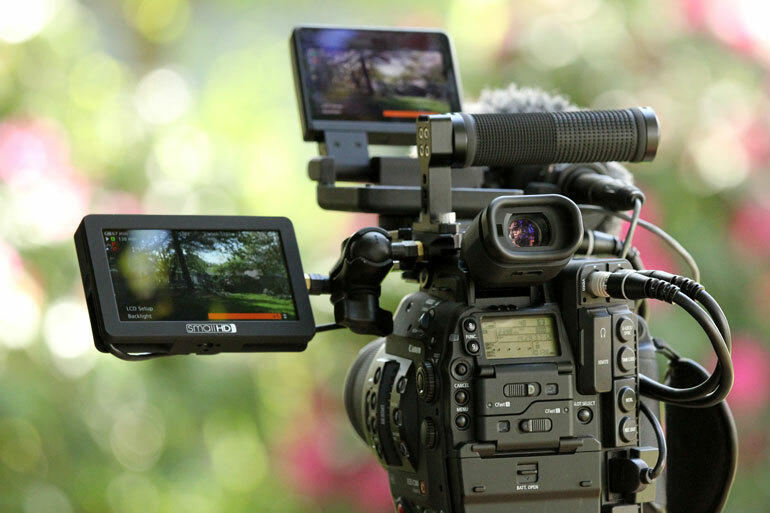 We compared it to our 4-inch LCD display on our Canon C300mkII, which is notably brighter than the display on the original C300, as well as the C100 mk1 and mk2. The SmallHD FOCUS looks to be comparatively bright with the C300mkII display set to Backlight +1. The C300mkII display does go up to Backlight +2, but that little boost doesn’t make a huge difference. So all in all, most users will be pleased with the brightness of the FOCUS. And after using it, you may have a hard time going back to using other monitors, like the SmallHD 501 which has a 400 nit LCD display. Of course, the Ultrabright 503 is in a league of its own, but you also have to consider its weight, heavy battery drain, and overall price difference to decide if it’s worth the upgrade for your productions. 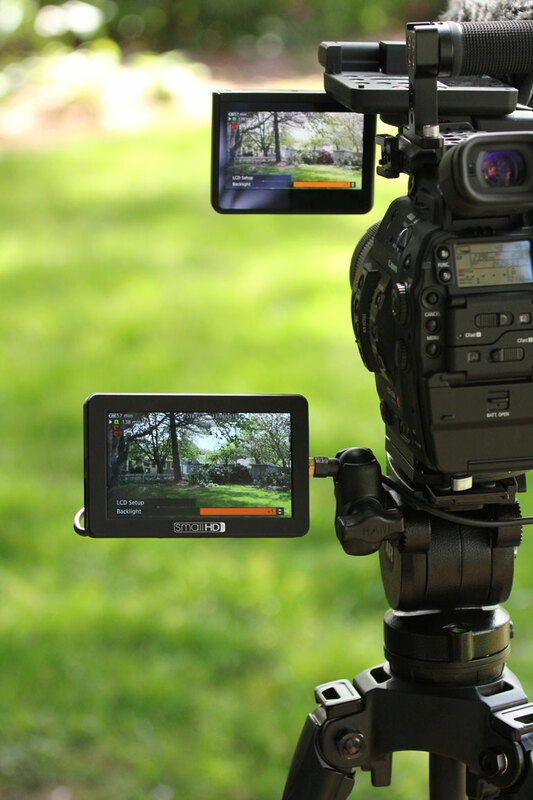 For some, the 720p screen resolution seems like it would be a problem for focusing, but for a 5-inch screen, SmallHD says the pixel density is better than an iPad with Retina display. It's certainly good enough for our eyes and we're accustomed to high resolution displays on pretty much all our equipment. The inclusion of a cold-shoe tiltable camera mount is a very handy feature of the FOCUS. 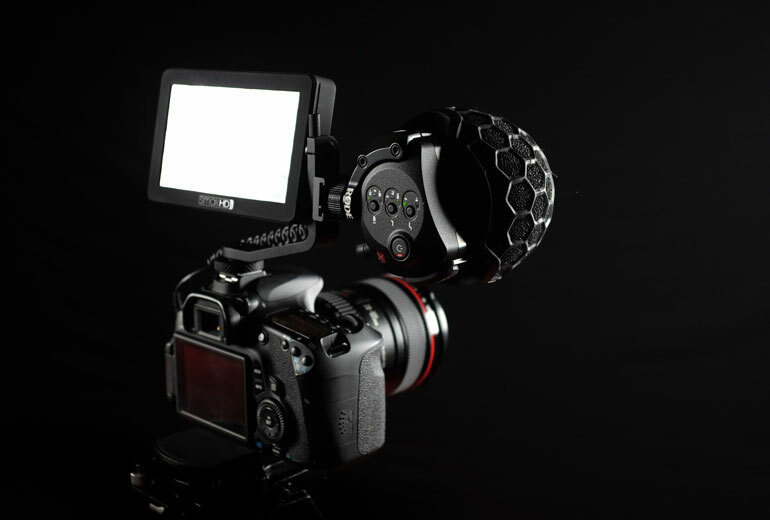 For videographers who like to shoot with simple, unrigged DSLRs and mirrorless cameras, you can mount the FOCUS and an external microphone to the camera’s cold shoe, without having to buy any additional cages, top plates, or accessory mounts. The mount doesn’t just have to go on the top of your camera. 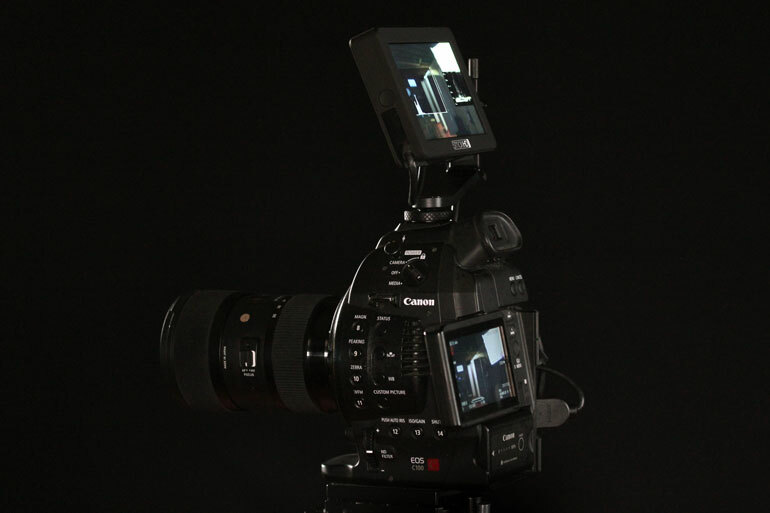 We found it to be a brilliant addition to our C300mkII with a Wooden Camera Top P﻿late for C100/C300/C500. Placed low and at the front of the camera, we found it to fit really nicely for handheld shooting where we’re holding the camera against our chest or stomach, in much the same way that many Canon Cinema camera owners shoot handheld. With a hex key, the mounting arm is easily removed and you now have three ¼-20” threads on the FOCUS unit itself to mount in any direction you please. Having a thread on the side is particularly convenient for mounting the monitor on the side of the camera, using a short accessory mount (here we’re using our favorite Cinevate Universal Accessory Mount). As a bonus, the Mille﻿r Air Carbon tripod head conveniently has ¼-20” threads where the pan handle connects on either side of the head, which makes connecting the FOCUS even easier. (We do a lengthy review of the Miller Air tripod here). 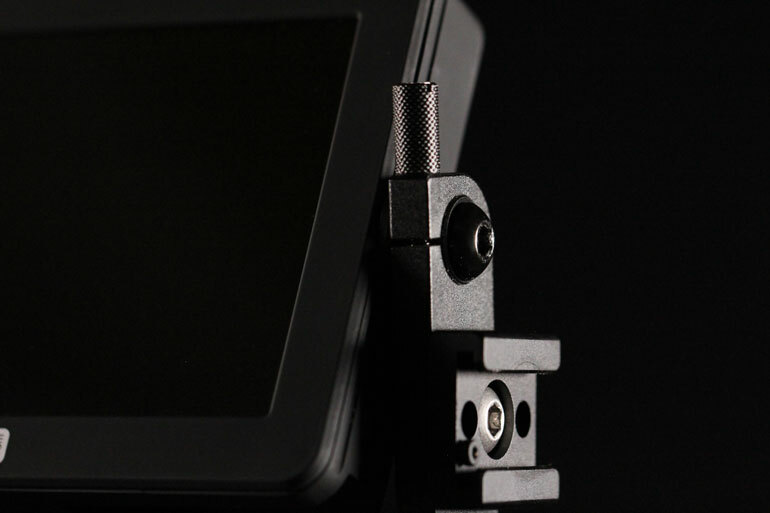 By default, the FOCUS mounting arm can be tightened with two points: first, a hex key tightens the arm to the monitor, and second, there’s a little knob at the top where you tighten the tilt angle. We found this can still leave a little play in the tilt, which isn’t necessarily bad, since most of the time we’re constantly adjusting the tilt of our external monitors. But if you want a more solid connection, you can replace the screw with a simple hand screw or wing nut, giving you a tool-less adjustment that can firmly secure the tilt angle. Since this is a preproduction model, perhaps the final unit will feature a similar hand screw. But we’re doubtful, since the one issue with the hand screw is that it gets in the way of the cold shoe right below it. 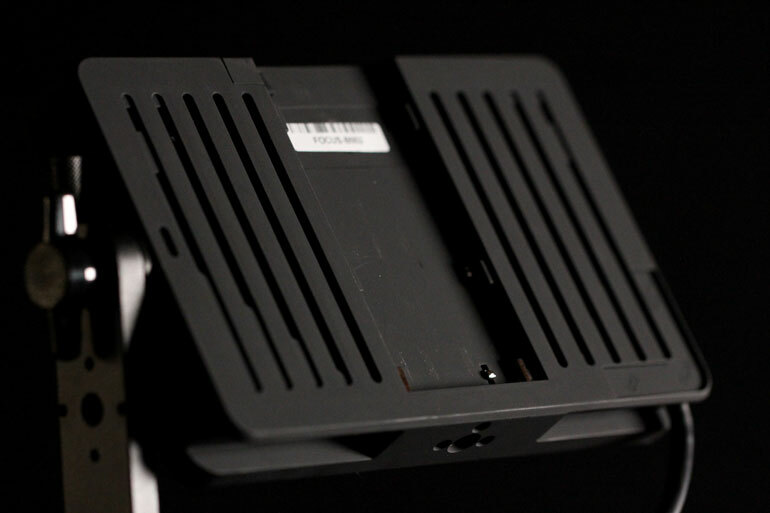 Providing a ¼-20” input on the mounting arm is a nice addition, and kudos to SmallHD for including it. What’s more, they are kind enough to include a cold shoe adapter as well. 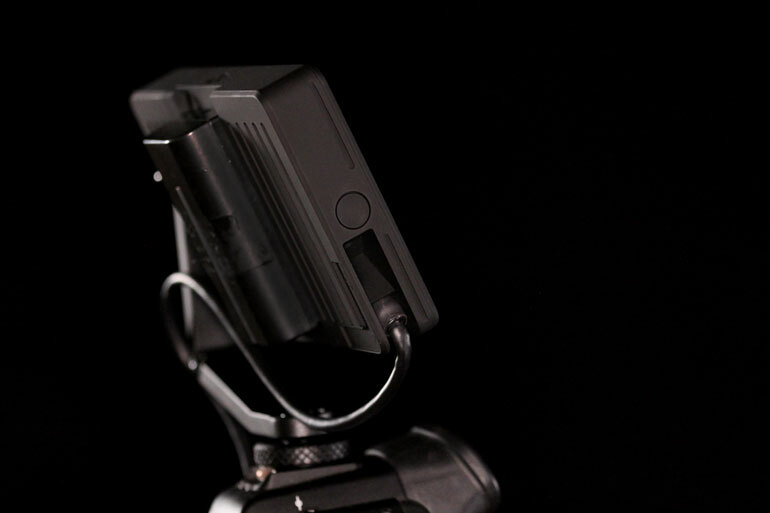 Now you can attach a shotgun microphone, or a wireless audio receiver, or an external audio recorder, or even an on-camera light without having to rig up an additional cage or cheese plate system. 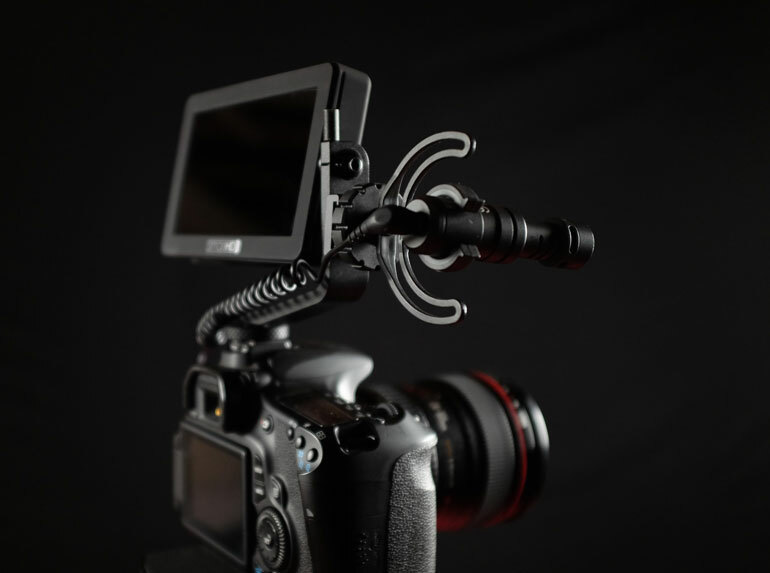 As far as mics go, the Rode VideoMicro is a natural fit for FOCUS users with small DSLR and mirrorless cameras. Here we show how compact the overall package is. Unfortunately the Canon cameras we use don’t actually power the Rode VideoMicro via the 3.5mm jack, so if you’re a Canon shooter you’ll need to use a battery-powered microphone. The new Rode VideoMic Pro with Rycote suspension is a great solution here. Since the cold shoe placement makes the microphone mount sideways, the older VideoMic Pro suspension bands won’t hold up the mic unless it’s sitting top-down. 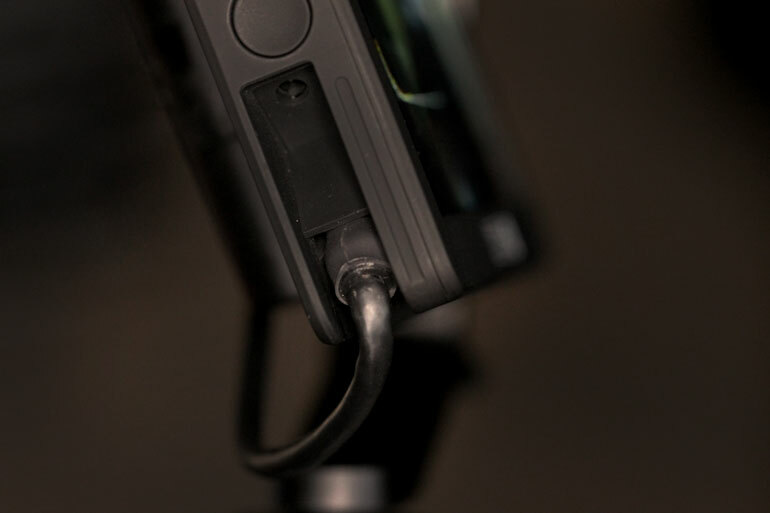 We also tried mounting the Rode Stereo VideoMic X on the mounting arm, and it fits like a glove. The SVMX has a built in suspension system, so we don’t need to add a shock mount, but if you have a typical battery powered shotgun microphone, you’ll most likely need to get a shock mount. There are an assortment out there, but the Auray DUSM-1 is a popular low-budget choice that we’ve been using for a few years. 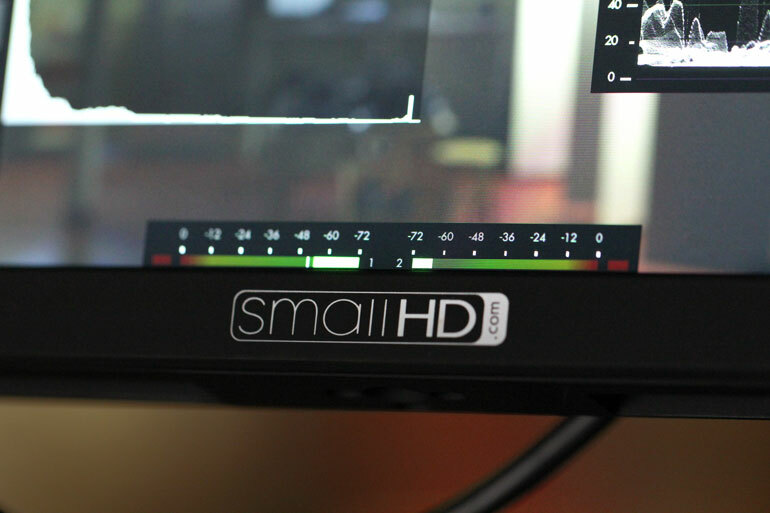 The SmallHD FOCUS has only one camera output - micro HDMI. HDMI cables are notorious at being loose and getting unplugged by accident, which is why locking pins are recommended for most HDMI connections. 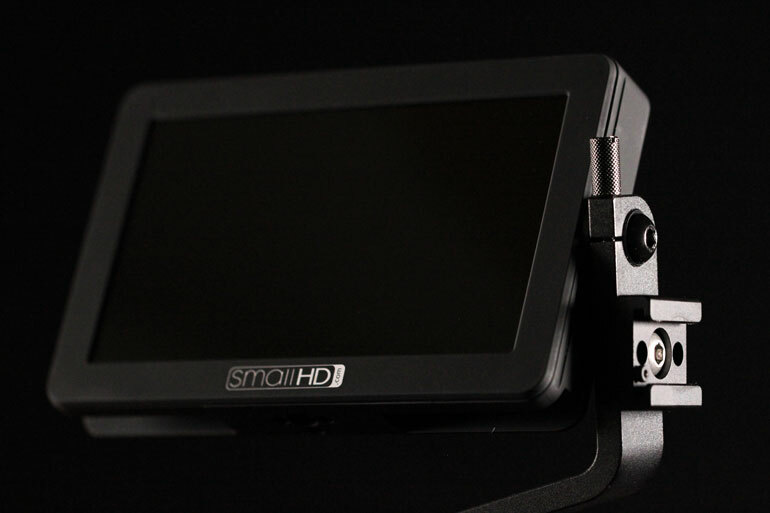 However, SmallHD were smart to design the FOCUS in a way that features a built-in secure wall around the micro HDMI connection, to prevent it from being easily removed. One issue that we ran into is the spacing for the micro HDMI plug is tight, and none of the micro HDMI cables we had lying around would fit in it. SmallHD did provide us with a proprietary micro HDMI cable that had a plug that was perfectly sized for the FOCUS input. But the other end was also a micro HDMI, and our cameras have either Mini HDMI or full size HDMI outputs. An adapter like this one would suffice here, but we couldn’t order one in time for this review. So we ended up chiseling one of our Micro HDMI cable plugs to fit inside, and it’s now a really tight fit, but chiseling cables isn’t ideal. 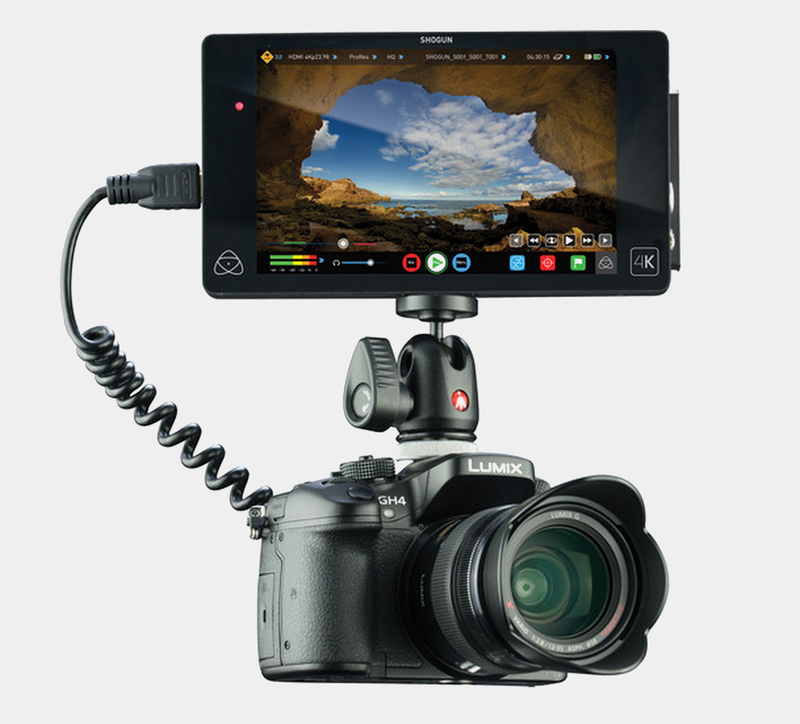 Luckily, we’re told SmallHD will provide cables that fit all three systems: micro, mini, and full HDMI connections. That way, no matter what your camera output is, you’ll be ready to go out of the box. 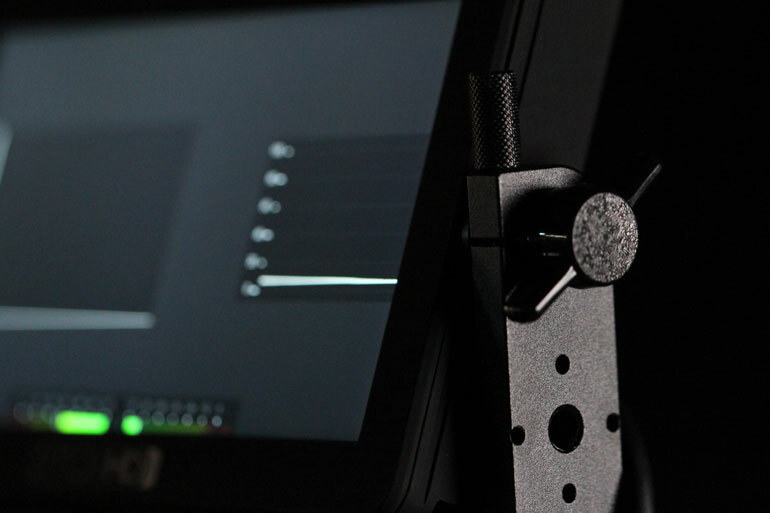 The software features built inside SmallHD monitors are second to none, and the FOCUS includes everything that their higher end monitors have, including exposure tools such as waveform, histogram, and false color, as well as 3D LUT support. Because the FOCUS has a touch screen, you can easily add your favorite tools in an easy to access shortcut screen. Now you can simply touch the screen, turn on or off the waveform, for example, and then swipe out to exit. 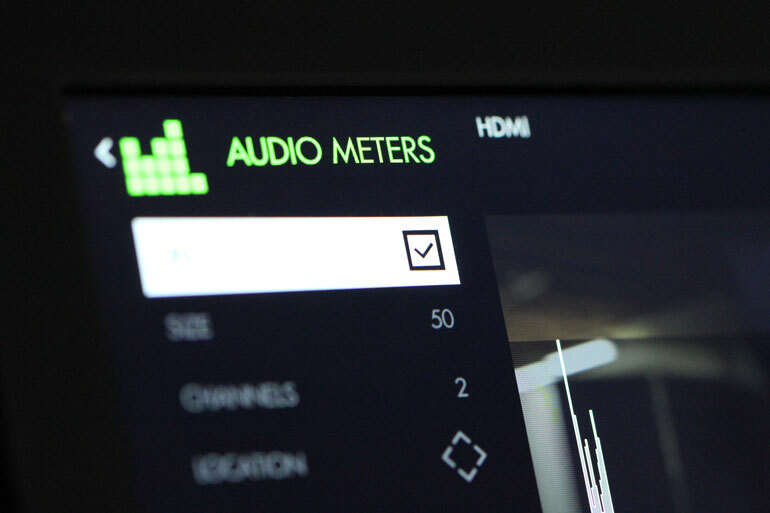 Audio monitoring is also included, which is a handy feature because most DSLRs and mirrorless cameras have terrible audio monitoring on their built-in displays. And again, you can easily turn the feature on or off with a simple swipe. Most importantly, we found the ability to adjust the size, placement, and opacity of the tools an incredibly useful feature that most external monitors and built-in displays lack. Often, a waveform or histogram display gets defaulted to a position on the screen that gets in the way of seeing your full frame adequately. Being able to adjust opacity, for example, is a super intuitive way of displaying a histogram or waveform without blocking your frame. The one gripe we’ve heard from others who checked out the FOCUS is that a touch screen can introduce fingerprints quickly. But while the monitor is on, it’s hard to see any fingerprints, and we’re actually glad that the monitor doesn’t have a lot of buttons on the exterior. 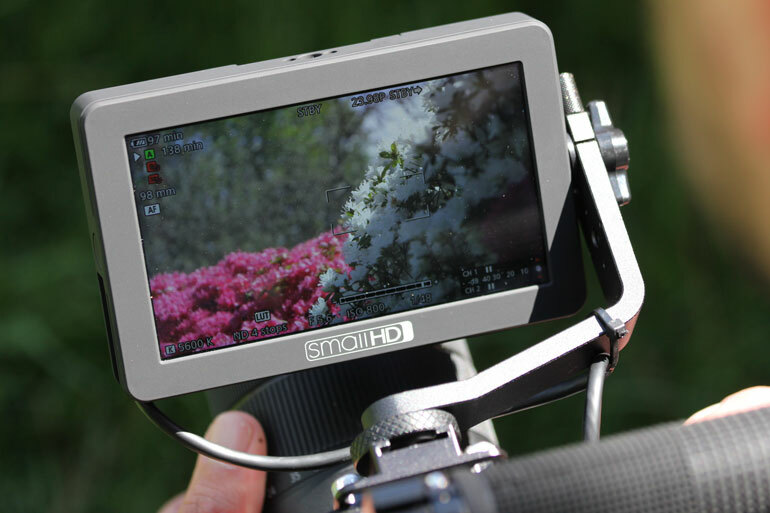 If you look at the SmallHD 503, for example, the buttons are highly visible and can be distracting from the image on the screen. Plus, many DSLRs and mirrorless cameras have touchscreen on their built-in LCD displays, and most users are happy about that feature, so we think the touchscreen display on the FOCUS is actually a positive rather than negative feature. Whereas the SmallHD 501/502 has two battery slots for Canon LP-E6 batteries, the FOCUS has one slot for a standard Sony L-series / NP-F battery. This is a huge upgrade, in our opinion. Sony L-series batteries are known for lasting much longer than the LP-E6 batteries, and that’s in their smallest size. The Sony batteries come in a variety of sizes and are widely available at very low cost. Like most video professionals, we already have a ton of the Sony batteries, so we’re ecstatic that SmallHD has moved to this system. If you’re wondering how long the Sonys will last, we powered on our FOCUS and connected it to a C100, and let it slowly drain. After a few hours, we basically stopped tracking the time. Overall battery life might be reduced if we had run around with the monitor, using all the available exposure, audio, and LUT features, but the point is the FOCUS has a superb low power draw. This is one of the advantages of using a dedicated external monitor, rather than tying up the batteries with heavier tasks in a monitor/recorder unit. And compared to the 503 Ultrabright, which requires a battery plate and some heavy duty batteries to power it for long usage, the FOCUS couldn’t get any simpler. However, the true gem of the FOCUS is its ability to provide auxiliary power to cameras. Sony L-series batteries come in a variety of sizes - another advantage to the Canon LP-E6 batteries - so with a medium or large Sony battery you can expect to power the FOCUS and your camera for a long time, without having to bring a number of small batteries along. We couldn’t test this feature for this review, because we didn’t have any dummy batteries around, but we’ll give it a shot soon. 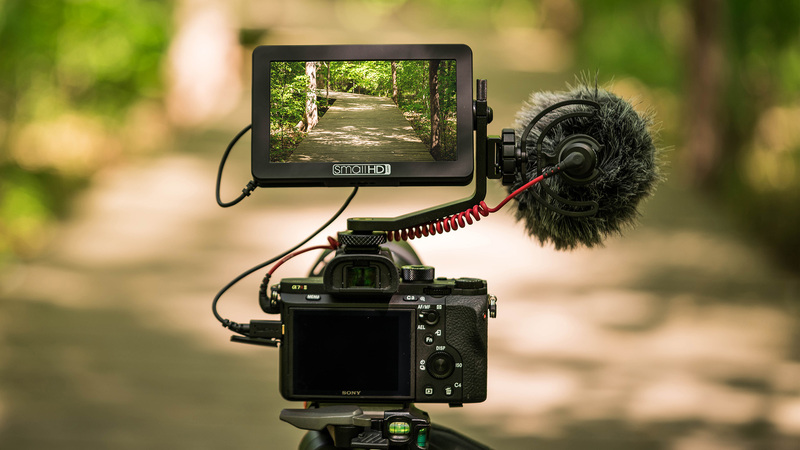 We’ve heard from many other videographers who wonder why the market is saturated with 7 inch displays, when 5-inch displays are much more suited to small, lightweight rigs. The last 5-inch recorder that Atomos produced was the Ninja Blade, and since then they have committed to the 7-inch display/recorder. But have you ever seen what a 7-inch monitor with batteries looks like on top of a Panasonic GH4, or a Sony A6300? It overwhelms the camera. 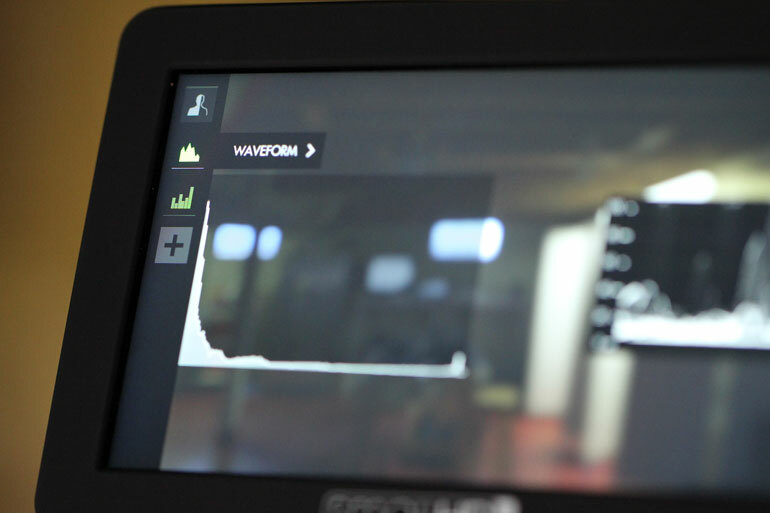 The bulk of the 7-inch displays leads many shooters to simply avoid external monitors and live with their camera’s built-in displays. When the SmallHD 501 came out, everyone breathed a sigh of relief. Order was restored. We’ve seen countless 501s on every rig imaginable, which is proof that many people out there feel the same way we do about the size of the monitor in relation to the size of the rig. We also have this 3.5 inch external monitor, which is great for gimbals but doesn't help you see much more than your camera's built-in display. 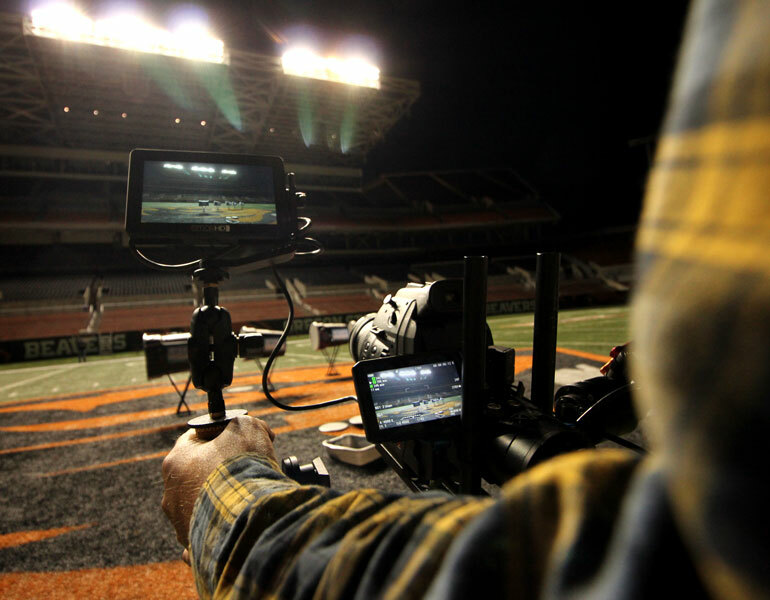 Our 4-inch C300mkII monitor is better, but still not big enough. Now 5 inches - that’s the golden size for on camera monitors. In a world where camera manufacturers are seemingly holding back features from lower end models in order to protect their high end products, we’ve become accustomed to not getting everything we want without paying a premium for it. 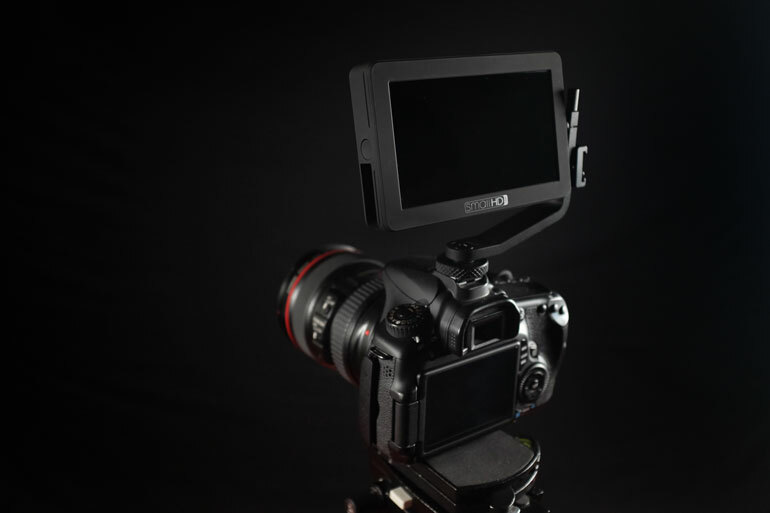 And yet, the SmallHD FOCUS is the first product we’ve seen in a long time that gives users precisely everything they want, at a very affordable price. The SmallHD 501 has been an ultra popular staple on top of many camera rigs, from DSLRs and mirrorless cameras, to high end cinema cameras. 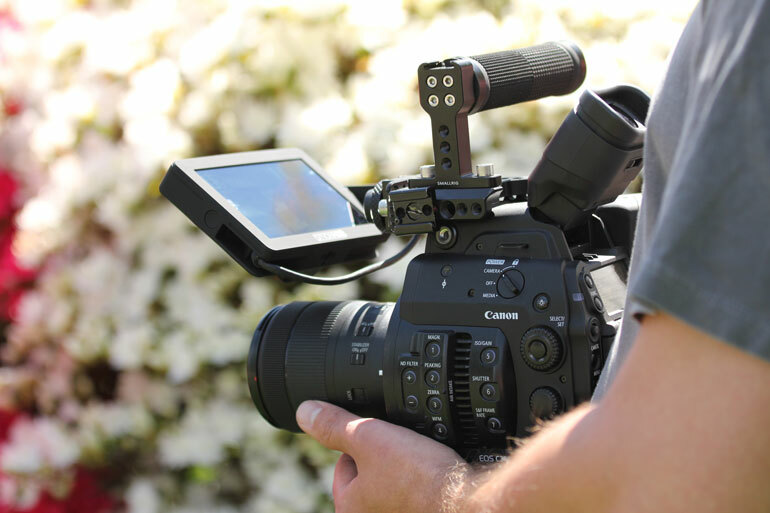 It has provided the perfect solution for many video producers who want a small, lightweight on-camera monitor. But now the FOCUS is here, at half the price of the 501, with twice the brightness, and all the included features. We’re sure we’ll be seeing this monitor everywhere for a long time to come. 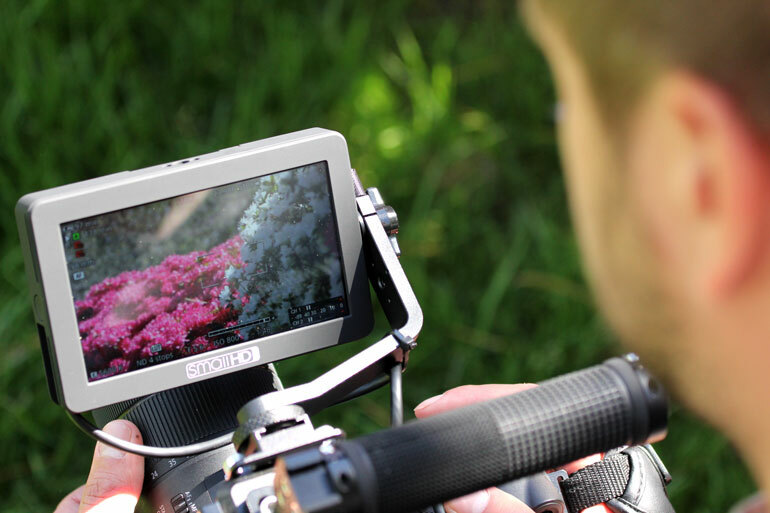 We used the SmallHD Focus on a Letus Helix Jr recently.